Pura Batu Medau or Medawu is located in the eastern peninsula of the island of Nusa Penida and is one of the largest temples on the island. 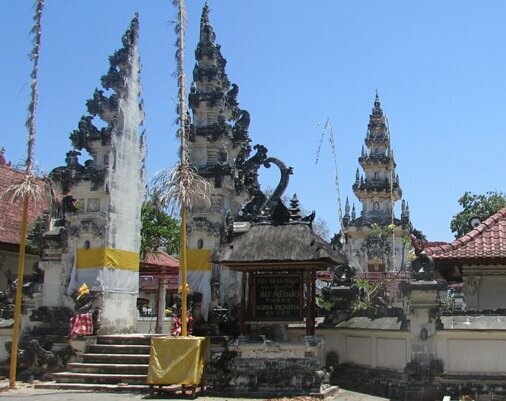 The temple is situated in Suana Village, District of Nusa Penida, Klungkung Regency, Bali. 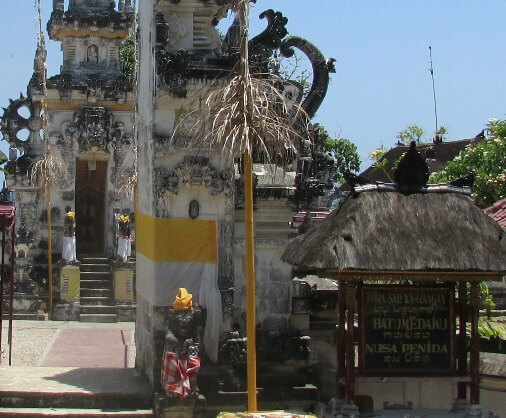 This holy temple is part of the three main temples called Pura Tri Purusa in Penida Island. The Pura Tri Purusa includes Pura Puncak Mundi, Pura Batu Medawu and Pura Dalem Ped. The name of "Medawu" is come from words "perahu medah batu" or the ship splitting the stone / rock. This word is strongly associated with the story that mentioned in Babad Nusa. At the time of pujawali which falls on a Wednesday / Buda Kliwon Pahang (every 6 (six) month), many Hindus come to pray and invoke for the guidance of wisdom.This sacred temple is highly respected and recommended for lovers of spiritual tourism. This temple consists of three main temples include Pura Segara as a place of the first worship, Pura Taman (the second) and Pura Batu Medawu as a place of the last worship (also called Pura Penataran). There is uniqueness in Pura Taman which boat-shaped when observed from the side. In this temple location there are many coconut trees and in the courtyard outside the temple there are many canopy trees. Visitors can enjoy the beautiful coastal scenery, vast sea with blue water, beautiful sunrise and the romantic sunset views. In addition, visitors can also see the islands of Lombok in the distance.